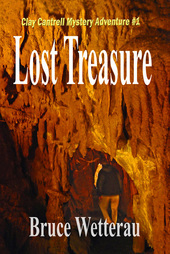 Official Author Site forBRUCE WETTERAU - Home Page - Author Bruce Wetterau wrote Lost Treasure: A Clay Cantrell Mystery Adventure, about a hunt for Confederate gold buried in a Virginia cavern as the Civil War ended. You might say Clay Cantrell and his friend Mac Harper have one foot in the past and one in the present. Their hometown, Staunton, Virginia, is steeped in history, and it's many 19th century buildings are fertile ground for anyone harboring a kinship with the past. Clay and Mac got their start in business by renovating an old grist mill on the outskirts of Staunton, and the mill now serves as Clay's home base. At first glance, Staunton itself might seem a peaceful, country village nestled in the foothills bordering Virginia's bucolic Shenandoah Valley. But like all places where people come together in numbers greater than one, there is more going on than meets the eye. That's grist for our two heroes, who are both ex-Army Rangers. They've made the transition from a life of daring military exploits to what should be a humdrum civilian career as partners renovating historic houses, but they cannot quite escape their adventurous past--trouble has a way of finding them. They know how to take care of themselves, though, and fortunately for us, they're not the type to let go of a mystery until it's solved. When the series begins, the ruggedly handsome Clay is still single and playing the field, but he soon finds his match in a ravishing brunette, a Staunton real estate agent named Susan Stratton. The course of true love, they soon discover, is never easy. Mac, for his part, is married to Rita, a warm-hearted woman who has built a thriving catering business. A third friend of Clay's is a high school history teacher named Jimmy Campbell. He is married with three children. Jimmy's knowledge of history is the link in the first book, Lost Treasure, to the theme that plays out in all the Clay Cantrell Mystery Thrillers: the historical back story. It's really a full-blown, second plot line interwoven with events in the modern-day mystery story. And in each book, that historical narrative ultimately bridges the river of time, so to speak, to reach forward in some way and effect the contemporary mystery Clay and Mac are trying to solve. In book one, for example, flashbacks to the last days of the Civil War eventually reveal how the Confederate gold came to be lost and become the source of a surprising revelation for Clay as well. But I shouldn't say any more than that here. In the second book, Killer Fog, flashbacks to prewar America tell the story of a Nazi spy ring operating here and provide key clues to the mystery Clay and Mac must solve. And in the third book...Well, we'll just have to wait until I've finished writing that one to see how events from a time long ago again somehow bridge the years separating past and present. Let me leave you with a final thought: "The past is clear as a mirror, the future hard as lacquer," or so says one of those inscrutable Chinese proverbs. To which I might add, when it comes to the future, we cannot hope to see any deeper than that. But then, inevitably, that's the mystery at hand that Clay and Mac must solve. For a brief description of one or the other Cantrell series books, click on the appropriate cover below. The link will also lead you to reviews, an excerpt (read for free), a nonfiction article or two (blogs?) on subjects relating to the books, author interviews about the book, and quick links to booksellers for purchasing a copy.